August Derleth (1909-1971), the admired and prolific Wisconsin writer and publisher, has produced a fabulous number of celebrated and highly collectible books, many of which are also quite rare. But is it possible that the rarest one of all isn’t even on most collectors’ radar? Among Derleth’s famous books is the omnibus collection of H. P. Lovecraft’s weird tales, The Outsider and Others, issued in 1939 by his publishing company Arkham House — often considered the cornerstone volume in any serious fantasy collector’s library, a book which in fine condition routinely trades for thousands of dollars. Less well-known, and perhaps truly rare in the required condition, is Consider Your Verdict: Ten Coroners Cases for You to Solve, released in 1937 by New York’s Stackpole Sons. The author, mystery writer Tally Mason, is a pseudonym for August Derleth. The answers to the ten puzzles presented are in the back of book, on pages fastened with a red seal. Finding a nice copy of this book with this seal still unbroken is a Holy Grail for Derleth collectors. Finding one for less than several hundreds of dollars is nearly impossible. We also find collections of Derleth’s poems filling many of those impeccably designed, limited-edition, hand-made books of the Prairie Press in Iowa City, Iowa. But the book that might be the rarest — the book the collectors should want to acquire if they only knew more about it — may turn out to be the very last book published with Derleth’s byline in his lifetime: Love Letters to Caitlin. A May-December romance in Derleth’s life (with a lover scandalously younger than he) had become the impetus for two final heart-felt Prairie Press collections, Caitlin (1969) and The Landscape of the Heart (1970), and for that last little goodie, Love Letters to Caitlin, issued under the auspices of Peter Ruber (1940-2014) and his Candlelight Press of New York, only a short time before Derleth himself would pass away on July 4, 1971. Readers who remember Derleth’s clandestine masterpiece of love lyrics called Psyche and the Caitlin love poems, have an unusual literary treat in store for them. Here are excerpts from love letters written over a period of two years, revealing an affair with all its passion, tenderness and candor. It is not a book for the puritanical reader, and we urgently recommend that only fully mature readers add this book to their shelves. This is a large and exquisite limited edition, handset type, printed and bound by hand with imported papers by the famed Prairie Press. Ruber knew fans would remember Derleth’s Psyche, one of his earliest Prairie Press releases. Derleth’s attorney — according to August’s daughter April, who wrote to me personally — enjoys a checkered record for “putting away” Derleth items for safekeeping. Of course it is quite possible he merely believed the subject of Love Letters to Caitlin could damage the author’s reputation. 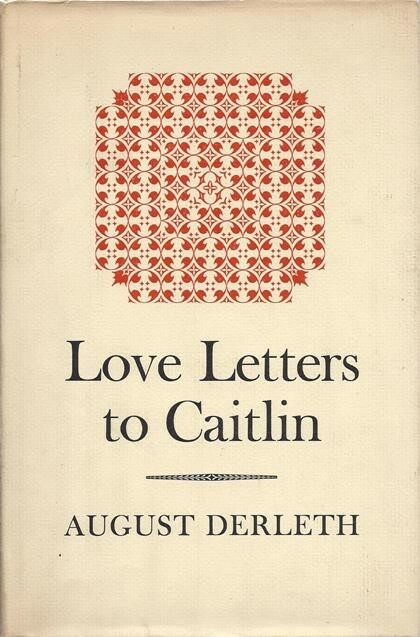 Love Letters to Caitlin came out two weeks before Derleth died. He had given out only 12 copies. All others were boxed and disappeared, under the supervision of his attorney. Someone might have to die before this will become available. Two more decades have since passed, but the questions remain: how many copies are (or were) there of Love Letters to Caitlin? Just those three or four used to illustrate the suggested binding that were delivered along with unbound sets of pages that could number anywhere between 100 to 750? Or were 12 copies bound, as Fawcett may have discovered? And this: the story of a second copy turning up in Wisconsin and listed on sale for only $200.00, which sold immediately to another bookman who knew the score and then sold it himself for the equivalent of $1,500. It looks like Coleman at Prairie Press was hired to do the printing for Ruber at Candlelight Press — not unusual for a small printer/publisher to take on job work for other publishers, most of whom were not printers. There is no evidence of the title/copyright page being a cancel or having been altered. Furthermore, the book proves that copies went out to the trade — there is a label from Kroch’s & Brentano’s on the rear jacket panel. It’s possible that the print run was quite small, possibly only one or two hundred — the Prairie Press poetry collections were only 200-500 or so each…. So, might Love Letters to Caitlin turn out to be rarest of all the books August Derleth one way or the other helped produce? But the book, if you want a copy — to select a proverbial comparison that is darn appropriate for Wisconsin — is less common than hen’s teeth. This entry was posted on Wednesday, March 19th, 2014 at 1:57 pm	and posted in AAW History and Affiliates. You can follow any responses to this entry through the RSS 2.0 feed. So Augie’s last is his rarest; this is Derleth’s “holy grail” – as the 1961 Arkham House very limited hardcover edition of THE SHUNNED HOUSE was for Lovecraft!!! This ultra-rare, legendary tome seems rarer than even Drake’s macabre poetry book A HORNBOOK FOR WITCHES – which was published by Derleth’s Arkham House Publishers, in 1950 !!! Yeah, but with only 10 copies confirmed…This may be as rare as the Necronomicon!